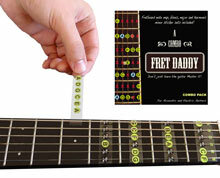 ﻿ Fret Daddy - LEARN FASTER. ROCK HARDER. Are you a beginner guitar player? Our online Learn to Play Guitar free tutorial series will get you up and running in no time. Fret Daddy is an international music company dedicated to music education. We provide you the tools you need to learn guitar. 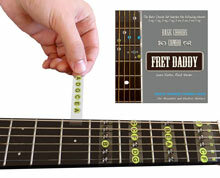 With Fret Daddy's award-winning instructional stickers, you can learn guitar notes, scales, and chords efficiently and effectively. PayPal's secure checkout system ensures that your payment information is always safe and secure. Check out in seconds. Never lose your pick again! 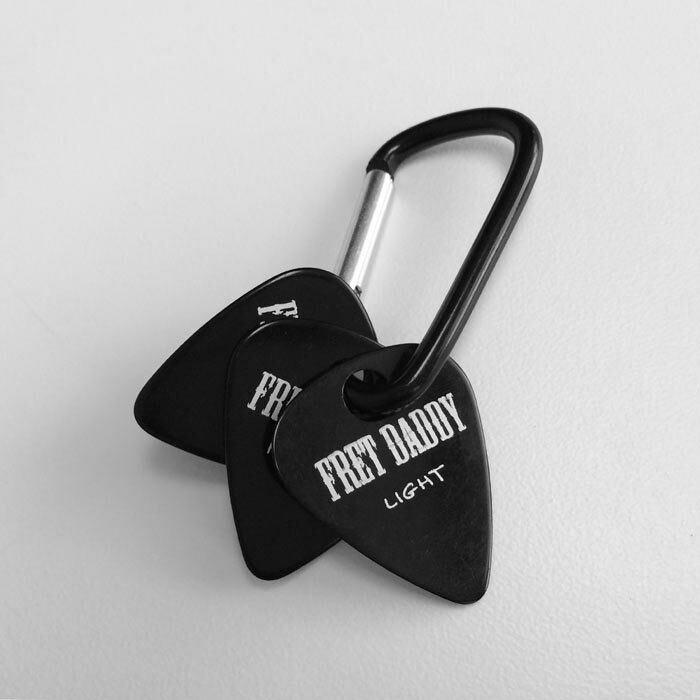 With the Guitar Pick Keychain, you can always have a thin, medium, and heavy pick with you, wherever you go! BUY IT NOW! 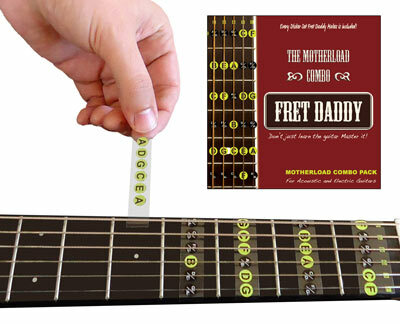 The Motherload includes EVERY sticker set Fret Daddy manufactures for Electric and Acoustic Guitar. The Motherload had everything you need to master the fundamentals. Buy more and save big! 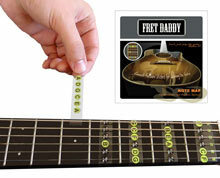 Fret Daddy is the world's leading manufacturer of *instructional stickers for guitar and bass. We are a San Diego based company dedicated to the mission of music education. We understand, being guitar players ourselves, how difficult it is to understand the vast complex fretboard for a beginning student. Our products and online tutorials are designed to take some of the sting out of the learning process and to help students learn more quickly and effectively. We truly believe our products will help you learn and we stand behind that belief. All sticker sets com with a 100% money back guarantee. If you are unsatisfied for any reason with your purchase, simply send it back to us within 7 days and we will refund your order no questions asked. The Motherload includes EVERY sticker set Fret Daddy manufactures for Electric and Acoustic Guitar. The Motherload had everything you need to master the fundamentals, namely: The Fretboard Note Map, A Blues Scale, A Minor Pentatonic Scale, A Harmonic Minor, A Major, C Major, and the Basic Chords. Buy more and save big! Buy it here. 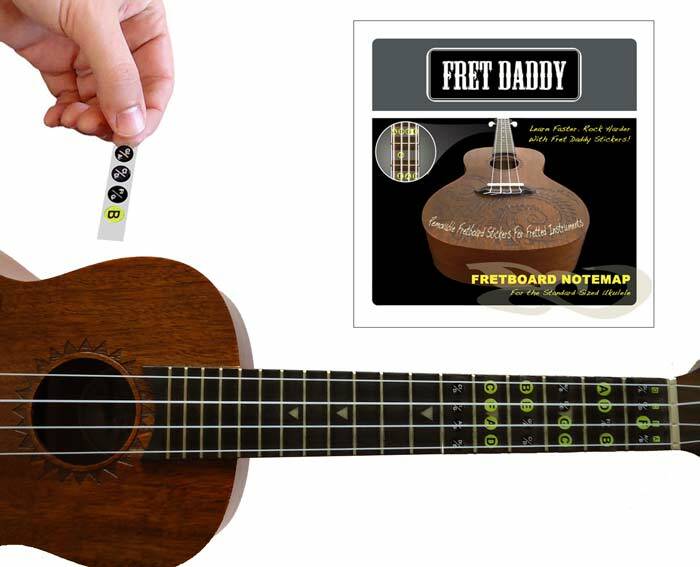 Perfect for beginners or intermediate players who never learned the names of the notes or for players transitioning from other instruments, the Fretboard Note Map for the ukulele teaches the names of every note on the first twelve frets of the ukulele. Fits soprano, tenor, and concert sized ukes. Buy it here. There are a variety of goals, important to the learning process, which may be more effectively achieved with the use of Fret Daddy products. Visualize music patterns more easily - One central aspec of applied musical theory is the focus on being able to understand musical patterns and, in the case of guitar, the ability to visually recognize musical patterns in relation to the guitar fretboard. Instructional stickers allow the student to readily observe such patterns with reduced mental effort. Master technique while learning the notes - another difficulty encountered by the beginning guitar student is the difficulty of trying to focus on a number of things at once. Students must hold the guitar pick correctly, strum the notes or the chords to be played, think about the musical patterns and modes being played, while articulating notes with the articulating hand - all simultaneously. By using stickers with the patterns to be learned, the student can free up his or her mental efforts and focus on other aspects of learning for a period of time. While, of course, the eventual goal is to be able to recognize patterns without the use of stickers - the temporary use of our products is extremely beneficial. Form chords with greater ease - While the beginning student focuses on learning chords within the first three to five frets of the fingerboard (the chords known as the open chords), the intermediate and advanced player must learn to form chords across the entire span of the fingerboard. This requires knowledge of the noteboard. Stickers with note indicia allow students to recognize obscure patterns, enabling the student to form a more robust understanding of the fingerboard and chord vocabulary. Translate knowledge of one instrument to another - Very often musicians learning to play the guitar are fully competent with another instrument - say, for example, the piano. Guitar stickers allow musicians who already understand musical patterns in the abstract to visually observe and understand how those patterns relate to the guitar specifically. Visually Identify concepts - With guitar stickers as a visual tool, the task of putting all of the pieces together, from strumming, to theory, to articulation, to pattern recognition, happens at a much quicker rate. While putting stickers on your guitar will not, in and of itself, turn you into a rock God or Goddess, it certainly will help you move in the right direction.